Bailey Hoff doesn't like "buttery stuff" on her sandwiches, so she wasn't a huge fan of the SunButter spread she taste-tested in Jeffrey Mudry's first-grade classroom at Bellefonte Elementary on Friday morning. "I do like peanut butter better," she said, but added, "It's always good to try." Food service workers are "spreading the sunshine," the slogan on the SunButter website, by using the sunflower seed spread in place of peanut butter for those elementary students with peanut allergies, making seed butter and jelly sandwiches for lunches. Barbara Eckley, Bellefonte's food services director, said the discussion about trying the new product started at Benner Elementary because there were siblings with food allergies. Now, peanut butter is only used for head start students who eat snacks and some meals at Bellefonte Elementary. Peanut butter is sometimes still served at the middle school, and the packaged peanut butter and jelly sandwiches called Uncrustables, from Smucker's, are served at the high school. "We don't make peanut butter cookies anymore," Eckley said, and they don't use peanut butter icing. 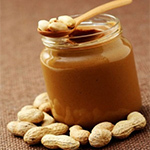 The Centers for Disease Control and Prevention estimates 4 to 6 percent of U.S. children under 18 have food allergies, and peanut allergies are one of the eight foods accounting for 90 percent of reactions. Eckley has documented 20 cases of peanut allergies at the elementary level, and a few at the secondary level. The schools register allergies in their computer systems, and food restrictions pop up in red when students arrive at the cafeteria cash register. She said most kids know what they can't have, but the electronic reminder can help. Students also have allergies to red dye, sweet potatoes, Styrofoam and gluten, though Eckley said most parents pack lunches for their gluten-free children. The elementary and middle schools also still have peanut-free tables in their cafeterias, where students with allergies can sit with friends who aren't eating peanut products. The State College Area School District's eight elementary schools also have peanut-free cafeteria tables, but any student who bought a school lunch can sit there. Food Services Director Megan Schaper said the district hasn't served peanut butter or other nut products for many years. That decision was made as food allergies became more prevalent. "People were requesting peanut-free buildings, and you cannot guarantee a peanut-free building," she said, noting a delivery worker could enter the building after eating a peanut butter sandwich for lunch. "We can assure if a child gets a lunch, it's going to be safe." Schaper said her district also uses SunButter, but just as another entree choice, since there's no peanut butter to replace. As Eckley carried a tray of sandwich quarters into Mudry's classroom for a taste test Friday, she explained the new sandwiches will be available in the cafeteria before they leave for Christmas break. SunButter and jelly is a weekly menu choice for young students. It was offered last week and is planned again for the week of Dec. 17. As she receives more feedback from students, Eckley said it could become a daily offering, as was previously done with peanut butter and jelly. "Student comments have been positive so far and our counts were pretty good the first time around," she said. "I will continue to monitor participation." Bellefonte schools are using their U.S. Department of Agriculture allocation, given each year as part of the National School Lunch Program, to purchase the SunButter. Because it's more expensive than peanut butter, Eckley said that helps the schools provide it. Despite that, Eckley said Superintendent Cheryl Potteiger previously worked in another district that used SunButter, and supported its use here. "As the years go on, it's definitely used more often," Eckley said of the alternative spread, after her talks with other food service workers across the state. "The superintendent made it clear that price was no concern." Jessica VanderKolk can be reached at 235-3910. Follow her on Twitter @jVanReporter.